A Committee of civilian experts, formed to assist the Coast Guard in developing regulations governing oil spill response plans for tank ves- sels, recently set the dates for future meetings over the next few months. Act of 1990, the committee, known as the Oil Spill Response Plan Nego- tiated Rulemaking Advisory Com- mittee, will work on regulations re- quiring tank vessels to develop plans on how they would respond to oil spills. Other regulations would specify what oil spill response equip- ment must be carried by each ves- sel. The committee, made up of repre- sentatives from state and federal governments, oil and transportation industries and environmental and citizens groups, held its first session in January and organized into five working groups. The committee plans to meet for four days every two weeks in Wash- ington, D.C. The working groups will meet separately the first two days and the full committee will meet the last two days. Seafoods. MARCO removed and replaced all existing power plants with two new CAT 3608 main en- gines and three CAT 3406 generator sets. The forward RSW tank was expanded by deleting wing fuel oil tanks and converting two ballast tanks. On the working deck, the yard modified and relocated an ex- isting gantry, at the same time in- stalling a complete hydraulic sys- tem plus trawl winches, net reels and gilson winches. MARCO crafts- men rebuilt the ship's crew accom- modations, modified the officers' quarters, installed electronics and performed a variety of structural repairs. The Institute of Marine Engineers in association with the Royal Insti- tution of Naval Architects is orga- nizing and sponsoring an interna- tional conference in London, May 20-21, 1992. The theme of the con- ference is "Offshore Safety: Protec- tion of Life and the Environment." Operations Post Piper Alpha confer- ence and will provide an opportu- nity for delegates to reappraise the situation in light of the develop- ments that have taken place in the offshore industry. Mark Lane, London EC3R 7 JN. Tel: 071 481 8493. Fax: 071 488 1854. 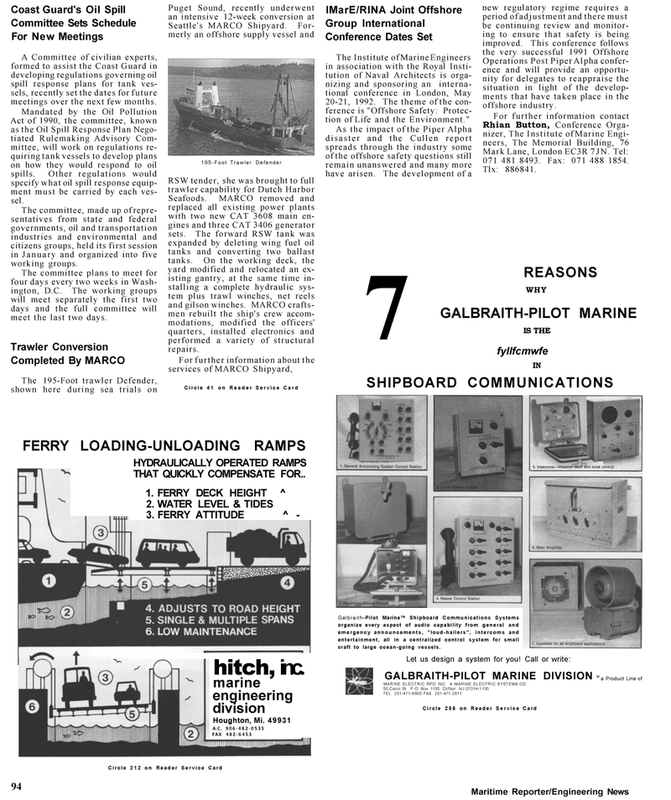 Galbraith-Pilot Marine™ Shipboard Communications Systems organize every aspect of audio capability from general and emergency announcements, "loud-hailers", intercoms and entertainment, all in a centralized control system for small craft to large ocean-going vessels.